Industry-led services to give you the best possible start in your career. At Futureworks you can expect to be provided with a variety of learning resources to help aid your studies. Our courses require you to interact with a lot of different resources, from books and journals to cutting edge technology and equipment. We have made major investments in our facilities and learning resources and our truly outstanding facilities and learning resources provide the variety of learning resources you need for your studies, both practical and academic. 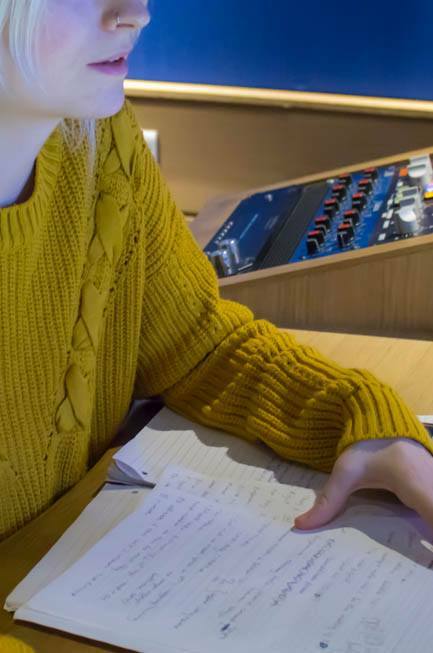 For practical study we have five floors of high specification, acoustically designed audio studios, post-production suites, dubbing theatres, computer labs and drop in facilities; all equipped with the latest industry-standard hardware and software. We recommend you check out our virtual tour for a closer look at the outstanding facilities available to our students. Our online booking system allows you access to the facilities no matter where you are, seven days a week. All students are able to set up an account which enables you to book the facilities you need to complete your practical projects. All Futureworks students are also given access to our virtual learning environment, MyFutureworks, which focusses student-staff interaction, teaching materials and facility information into one clear point of access. We provide various IT facilities depending in which School you are studying. School of Art & Design students have access to a limited amount of personal storage space on a shared network ; School of Sound & Music Production students have access to a shared samples library network; School of Film, TV & Media students are given access to the samples based library network and project based shared network drives. Printing facilities are available, including 3D printing, in the Learning Resource Centre. Accounts can be set up at Main Reception. Wifi is free to students throughout the building, allowing students to be online and work with huge files wirelessly in and out of studios. 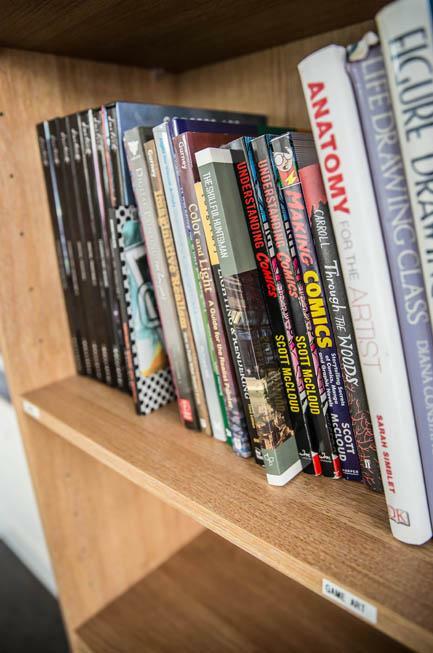 For academic study we offer a dedicated quiet study area and our specialised Learning Resource Centre houses a variety of books and magazines as recommended by each School. Whilst studying at Futureworks, you will have access to a range of physical and electronic learning resources, including books, journals, magazines, drop-in computing facilities and IT support. 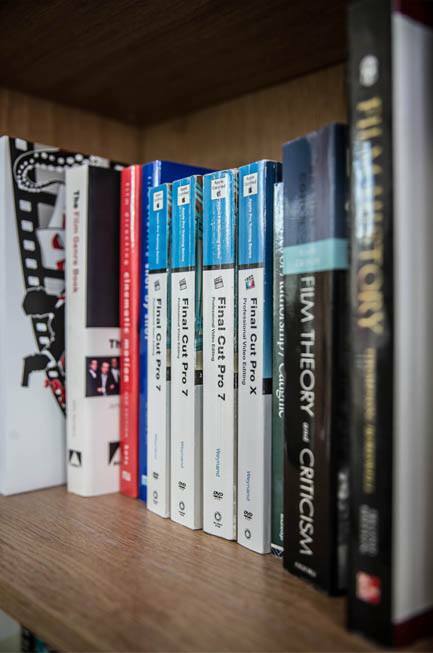 All of our books are carefully chosen and recommended by our industry-tutors, so that you get access to the best materials to compliment your course. You can access a full list of our library catalogue here. As well as accessing our wide range of books and e-resources, the library also has drop-in computer and printing/scanning facilities. 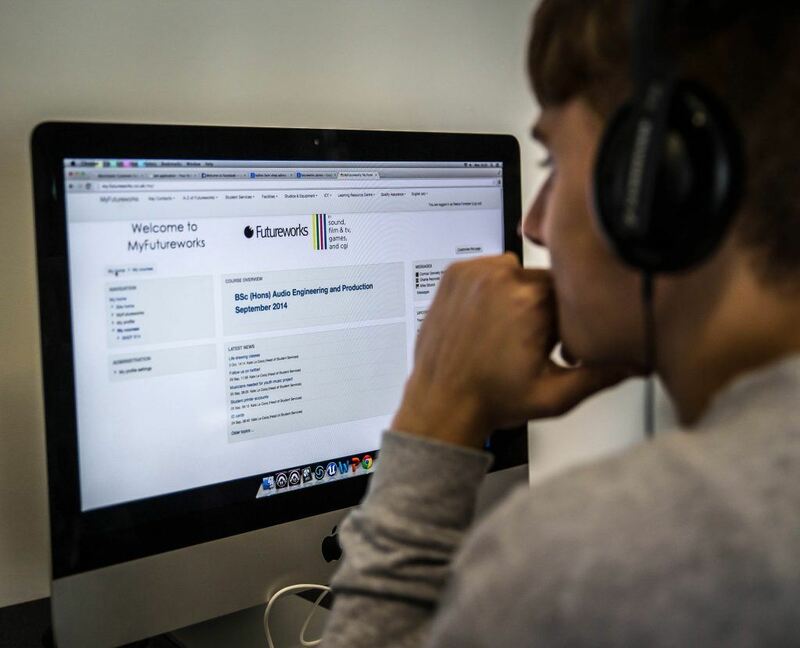 Futureworks students have access to a variety of electronic learning resources including audio sample libraries, example projects, video tutorials, lecture notes and course documentation, software and literature. Through our partnership with UCLan, our degree students have access to online resources including e-journals, e-books, e-databases, e-images and e-newspapers. They also have access to Lynda.com, which offers industry-led online tutorials in software, study skills and employability. UCLan students can also use VALNOW, a scheme which offers a range of library and information services which would normally only be available from UCLan’s main campus library in Preston. Alongside VALNOW, degree students can also use the Sconul access scheme which gives access to a variety of higher education libraries across the UK and Ireland. UCLan students are also entitled to register for a British Library Reader Pass providing access to British Library resources. For more information about any of the partner services provided by UCLan please visit their website. All of our audio computer labs provide iMac workstations for each student and the computer systems throughout Futureworks run a wide range of current pro-software. Alongside our computer labs there are also individual post-production suites available for smaller projects and drop in facilities. We have twelve music, mastering and post-production studios, with consoles such as Neve, SSL and Icon with equally impressive monitoring equipment including Barefoot MM27, Dynaudio M3A, Genelec 1037C and Quested VS3208. Our studios were designed by Harris Grant Associates who have been responsible for some of the best studios in the world including BBC Maida Vale in London and Battery Studios in New York. Our students are also able to access a huge variety microphones; from classics such as Neumann U47, U87, AKG C414 and Sennheiser E606 to the staple of the music industry, Shure SM57, SM58 –we have a mic for all occasions! Our studios include a multitude of outboard gear including Avalon VacuumTube 747, Drawmer TL241 Dual Compressor, Tubetech PE1C Valve EQ, FW Custom LA-2A and an AMS RMX16 Digital Reverb. We also have a host of preamps such as Telefunken V72 Valve, FW Custom 1073 and FW Custom Germanium. For those who prefer to use plug–ins we also have plenty of these including Avid, Sonnox, Izotope and Sonic Studio. Our Film and TV facilities include computer labs, editing facilities, colour grading suite, camera studios, post-production studios and a dubbing theatre; all containing industry-standard hardware and software. Our purpose-built computer labs are kitted out with Avid Media Composer and students have access to an impressive library of professional media footage ranging from well-known TV shows to feature films. Students also have access to post-production studios, including a 5.1 AV suite and dubbing theatre with a 126” widescreen and viewing area. Our filming equipment includes Blackmagic Cinema, Canon 550D, Canon 5D, Panasonic P2 HD and Go Pro cameras; Arri 300W, 650W, 800W, Felloni LED and Kino Flo Deva Light kits; Fostex FR-2, Zoom H4N and Tascam HD-P2 field recording equipment. We can also provide portable green screens to take on location amongst various other grip and location gear. Our Art & Design computer labs are specifically built and house hardware running the latest industry-standard software such as Autodesk Maya, Autodesk Mudbox, adobe Photoshop, Unreal Engine, Unity and Microsoft Visual Studio. Alongside computer labs there are also dedicated drop-in areas, featuring the same tools that you’ll find in any creative studio, and our incredible new motion capture facility. Art & Design students are able to access graphics tablets, Xbox controllers, webcams, lightboxes, MiniSun daylight balanced lightpads, tungsten balanced Copy lights and rostrum cameras running Flipbook Pro. These resources are also available via our online booking system outside of lesson time.